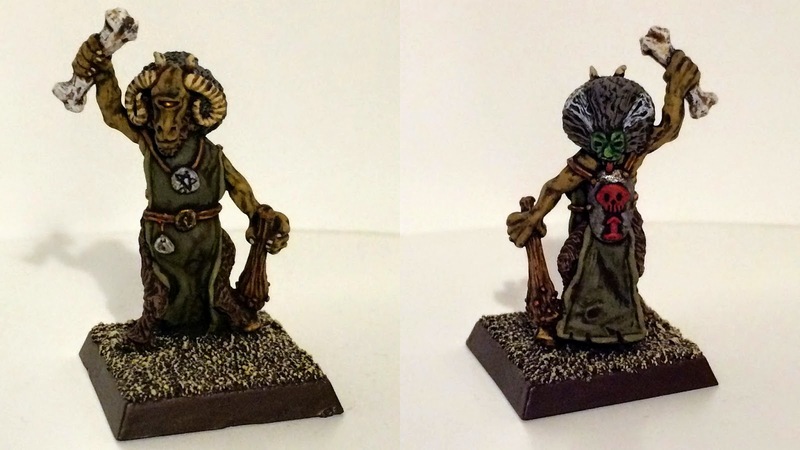 Lately my legions of Chaos Beastmen and Broo have been feeling a little neglected but while I have been getting back to my Rogue Trader and Judge Dredd projects I still managed to flick a bit of paint on a few Beastmen and enter them into my new Beastmen gallery. 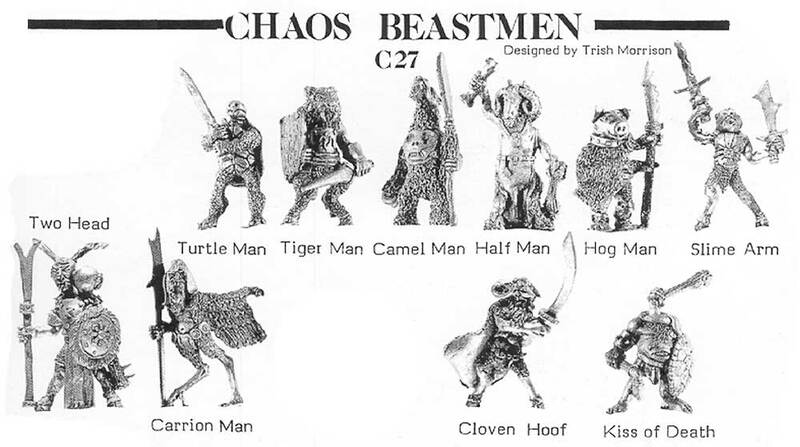 First we have Tiger Man a C27 Chaos Beastman from 1985, a really lovely miniature from this range just before miniatures started appearing with plastic slotta shields, coincidentally I am currently rereading Meltdown Man a 2000AD story from 1980 progs 178 to 227 collected into one volume by Rebellion and the main villains Leeshar's chief henchman is Tiger Commander who I think you will agree is almost a perfect clone of Tiger Man, I wonder if this story and the plethora of animal men had any influence on Trish Morrison's Chaos Beastman sculpts which are very different to the Runequest Broo that Citadel had did before. I also think Tiger Man might fit nicely into a Frostgrave Pan Tang Warband like this one I recently enjoyed viewing on Axiom's magpieandoldlead blog, go and have a look it's brilliant. 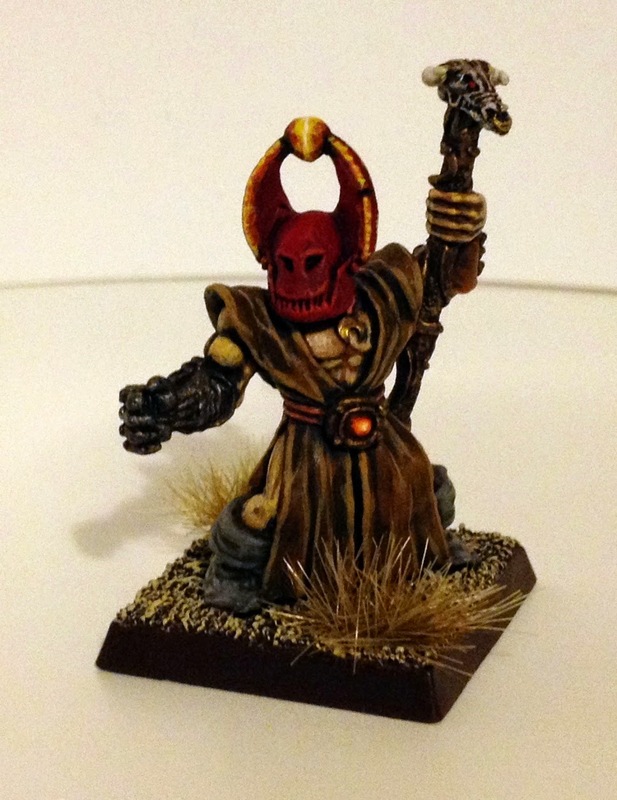 Next up we have Runequest Chaos Broo Runepriest from way back in 1982, a menacing looking creature, he will certainly be performing blood ritual with my blood priest. I discovered that this miniature was used as the base miniature for the C27 Chaos Beastman Half-Man, I had never noticed until I started thinking I've painted this miniature before which is quite a common experience for the first few ranges of Citadel Beastmen. Lastly we have a Broo with Spear or pointed stick in my opinion maybe hardened by fire at the point, a pretty basic and early Broo sculpt lacking in details and quite fragile, although it did require careful restoration due to it's thin legs. Wow, what a treat ! I'm especially impressed by the tiger man but all have that very dark and scary look that goes beyond the mutant archetype. thanks JB, I would like to see a return to real creatures of chaos and not just goatmen every time a range gets renewed. It's always a pleasure to see your latest beastmen Jason. They look spot on mate. That tiger man is fantastic! Every fig of that range from Trish Morrison is brilliant. Very good recreation of a tiger paint scheme on his face.